I shall be taking the opportunity over the next few editions to celebrate some of Ipplepen’s well remembered shops. Here are two to kick the series off. Situated at No 1 Dornafield Road and occupied in the 1901 census by Daniel Jones with Mary Gribble living there and listed as niece. It was run for many years by Winsor Gribble, then by Mr& Mrs Freemantle, Jenny and Tony Crampton, Peter & Francis Hill and finally Linda and Pietro Pradei. The shop closed in the mid-1990s. Thomas Bovey was listed as Butcher in Kelly’s Directory at the Grange in 1870, Thomas Emmet in 1901, and Simon Coleridge until 1933 when Bill Lang came to the village and retired in 1967. Victor Elliot took it over from Bill Lang and ran it until he retired. Up until the early 1960s animals were slaughtered on site which has now become Osborne Close. 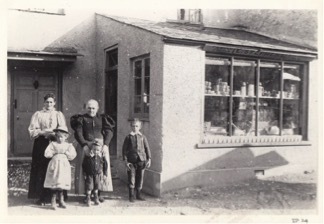 To maintain the theme here is a picture from 1894 of Stephens shop with Mrs Childs, her children and her mother outside their general store in Fore Street.